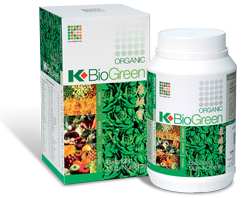 K-BioGreen is a Organic food that is specially selected from 58 unique types of ingredients such as beans, grains, vegetable, seaweed and bifido-bacteria and food enzyme that play important roles in the human body to cleanse and detoxify, to rejuvenate, to restore the healthy function of the vital organs, and build immunity. When this product is ingested into the body, it will give you a feeling of fullness that is suitable for those who aim for healthy diet and body slimming. The K-Biogreen is a "well balanced" nutritious food powder with no additives and non-genetically modified, which is certified by OCIA (Organic Crop Improvement Association) in USA. Take one scoop per serving and mix it with warm water before stirring it thoroughly. It can be taken from 1 up to 3 times a day. You can mix it with milk or juices for a better taste. This product contains lots of soluble fibers, which turn into gel form after mixing it with water. It is recommended that you take it as soon as it is prepared. Add 1 scoop (10g) of K-BioGreen to 300cc of warm water. Children: Add 1/2 scoop (5g) of K-BioGreen to 300cc of warm water. Only natural ingredients are used for this product, but if you notice or experience an unusual circumstances to your body, you must reduce the amount of consumption or stop consuming it. As it contains abundant fiber you may encounter loose bowel movements. Close cap firmly after use.